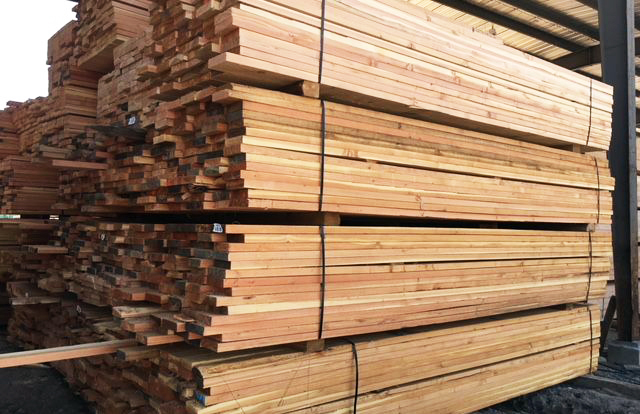 Woodco produces a number of industrial and specialty lumber products. Select a product below to view more details about what makes the Woodco products the right choice for you. Woodco produces full sawn, rough green timber and lumber products for industrial and residential applications. 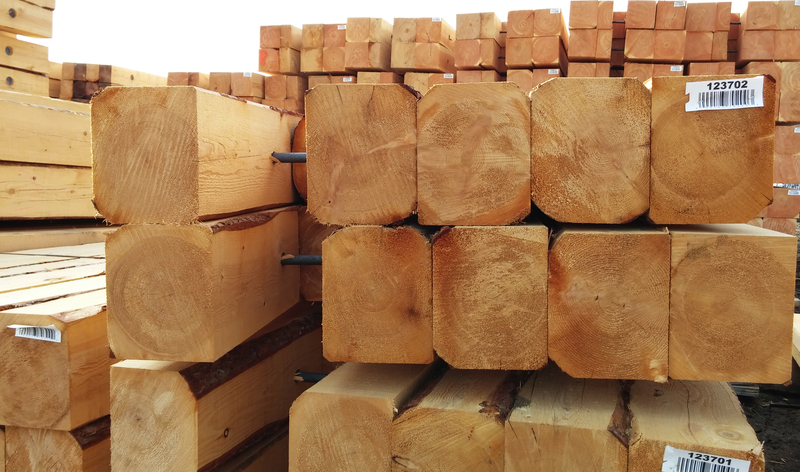 Woodco follows NLGA grading standards and is a member of the Pacific Lumber Inspection Bureau whom oversees grading standards, provides grader training and certification and issues grade stamp marks. #1 appearance and structural grade for residential applications and industrial applications. 1 to 3 inch lumber in 6-12 inch widths. Our crane mats are manufactured with strength and quality in mind. As we mill our own timbers, our quality control is able to ensure that only high quality wood is used in our mats. 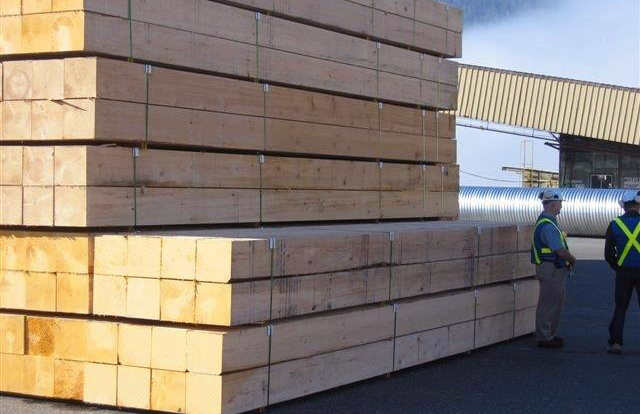 Woodco’s crane mats are constructed from 12”x12” Douglas-fir and Hemlock timbers. We secure the mats together using four 1” bolts which are counter sunk on both sides to provide a safe and clean finish. There is a lifting point at each end of the mat which is created by cutting a 6”x2’ notch to expose the first bolt. We carry a large inventory of 4’x20’ crane mats at all times in order to provide a quick turnaround for our customers. We also welcome custom orders and are able to manufacture mats to any dimension required. Dragline/digging mats are similar to crane mats but are manufactured with 8”x8” timbers. Again, as we mill our own timbers, our quality control is able to ensure that only high quality wood is used in our mats. These mats are constructed with Hemlock timbers, although Douglas-fir can be used upon request. Like our crane mats, we secure the mats together using 1” bolts which are counter sunk on both sides to provide a safe and clean finish. There is a lifting point at each end of the mat which is created by cutting 8”x2’ notch to expose the first bolt. These mats can be manufactured to any dimension required by the customer. These mats can be manufactured to any dimension required by the customer. Our pipe skids are milled from Hemlock logs which creates a longer lasting more durable product. 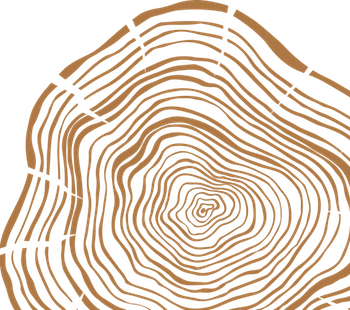 Hemlock has superior strength, rot and abrasion resistant characteristics compared to spruce, pine or balsam fir. Pipe skids are 4×6 dimension – in 4 and 5 foot lengths. Blocking is custom made to any size and length. Woodco has designed and developed innovative portable bridges for stream and ditch crossing. 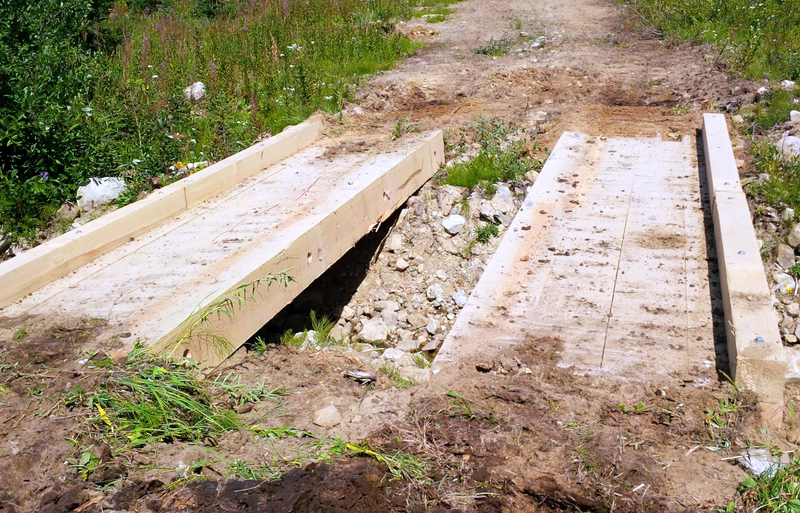 These bridges are ideal for resource and silviculture roads as they can quickly be placed and removed as needed. The bridges are of similar construction to crane mats as they are made from 12”x12” Douglas-fir timbers which are fastened together with 1” bolts. 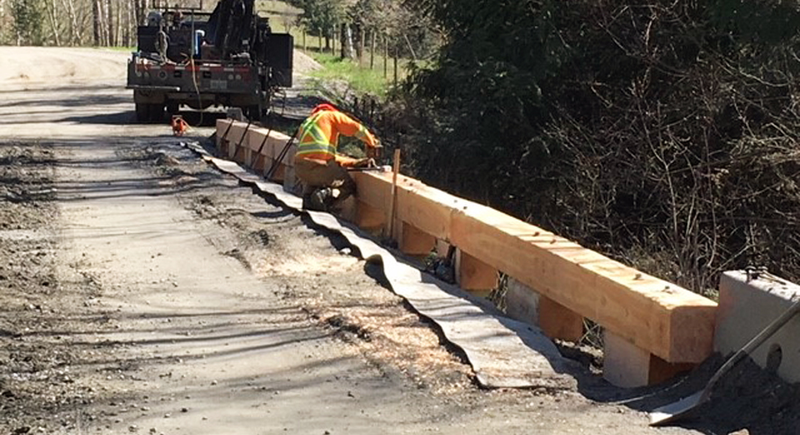 Guardrails are added for safety and also to prevent debris from entering environmentally sensitive streams. These bridges can be manufactured to any dimension required. Extra timbers can be added to each section in order to eliminate the center gap. These bridges can be manufactured to any dimension required. Extra timbers can be added to each section in order to eliminate the center gap. 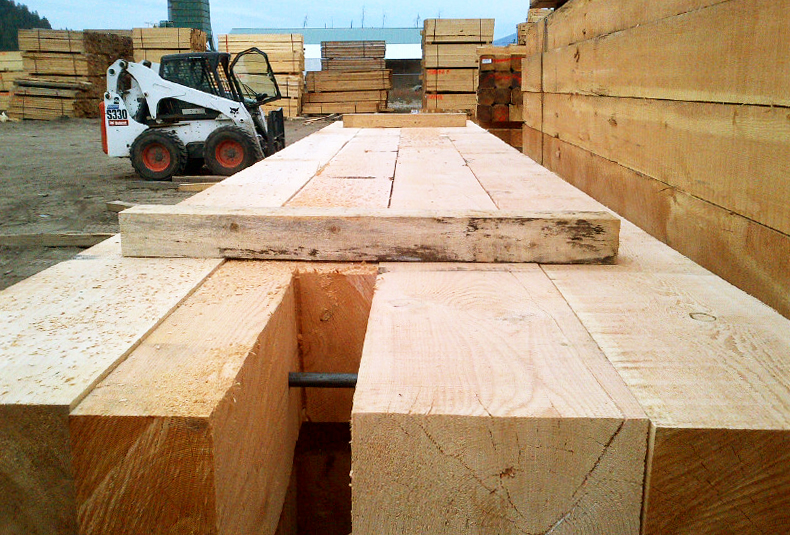 Woodco has years of experience in milling Douglas-fir bridge timbers. We mill complete bridge packages right from the stringers to the decking. 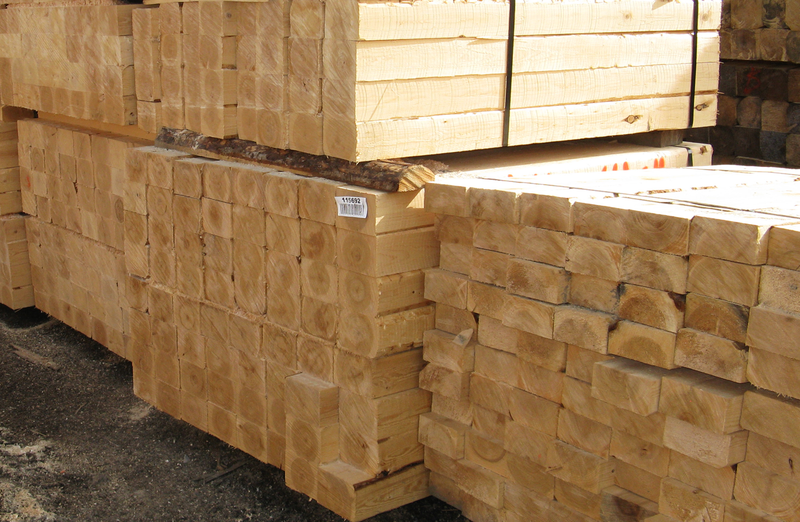 Each timber is inspected and graded as it comes off the mill prior to stacking. Upon request, we can also grade stamp each timber and provide a letter of certification. We also manufacture finished bridge modules at competitive pricing as we are able to better utilize the wood as it comes off the mill.